I was prompted to write this how-to post since some email marketers I speak to during Email Marketing training courses, use Google Analytics, but weren't aware it can be used for email tracking "beyond the click". This means that as well as getting reporting in your email marketing system on opens and clicks for your sends, you can also isolate visits from email in your Google Analytics to see which pages are viewed and whether visitors convert.To set this up email tracking you will need to tag your email with 'Google Analytics campaign tracking codes as explained later with the example in this article. 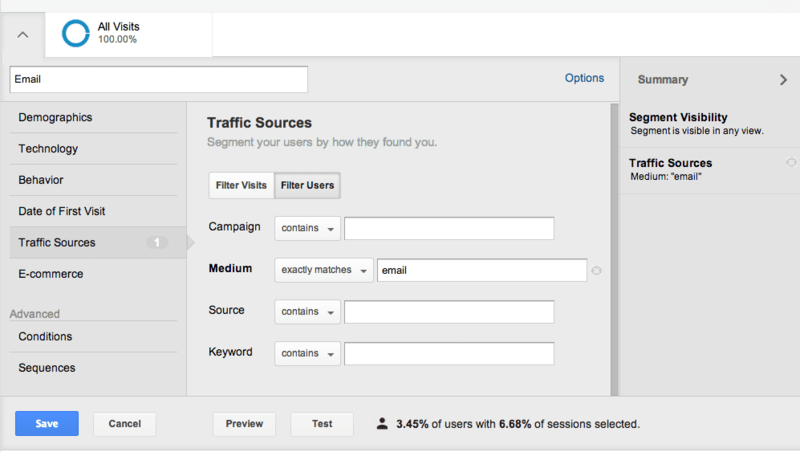 Once you're using tracking, Google Analytics segments can be used to isolate visitors referred from email to understand their preferences and behaviours. This really helps prove the value of email for your list members and to your company particularly if you have goals set up in Google Analytics. This is powerful insight since you can then compare different email campaigns and newsletters to see which produce the best results. Note: Before you go ahead and follow the advice in this article to manually set up campaign tracking, be aware when selecting an email broadcasting system that many email providers have added functionality to make it easy to track with Google Analytics or other web analytics systems such as Adobe Analytics. So, check with your Email Service Provider to check whether they support automated link tracking. This is a huge time saver since you can set up the campaign tracking tags within the email system rather than having to manually add them to the links or write your own scripts as we do, or use spreadsheets like that for our members as described below. A simple tool to help you standardise campaign tracking codes for email, social media and display ads. Our guide steps you through the setup stages, but focuses on how you use Google Analytics to get better business results - the missing link in most books and the Google documentation. The Advanced segment should be based on all visits to the site with a medium of ‘email’ set, provided that this is how you have labelled your links by tagging them. The next section shows you how to tag your links using the campaign tracking in Google Analytics. To setup email tracking, the links from your email to the landing pages should be tagged with standard campaign tracking parameters. These are up to 5 "name-value" pairs which are part of the query string for the URL (denoted by everything after the "?" in the web address as in the example below). FWIW, UTM refers to the "Urchin Tracking Module" on which Google Analytics is based.